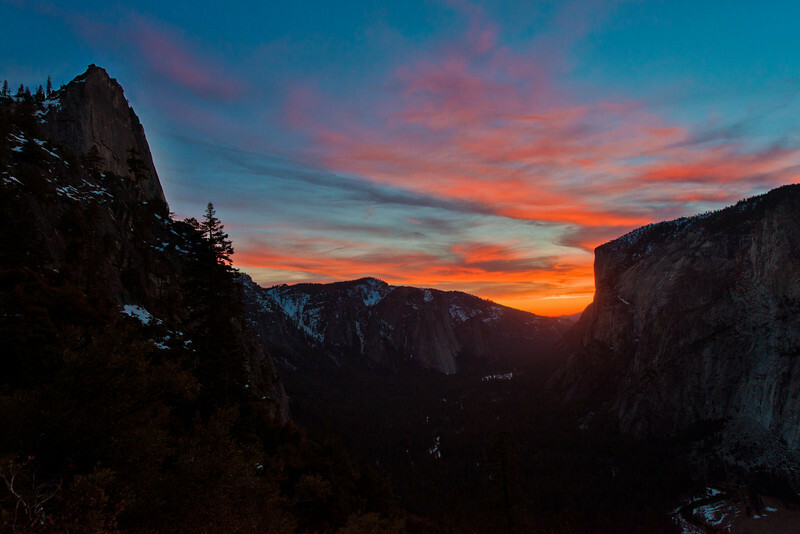 Here’s the winter sunset from Four Mile Trail in Yosemite National Park. Four Mile Trail runs from the Yosemite Valley up to Glacier Point, which is one of the best views in Yosemite. Unfortunately, in the winter, the trail is closed after Union Point. It probably should be closed before Union Point (at least when we were there), too. On the right of this photo is El Capitan, but probably “backwards” as compared to the iconic view of it. Sometimes you just get lucky. Photographers are quick to correct people who unknowingly say “nice camera” to them or things of that sort, and I’ve harped on the idea that taking good photos requires dedication. However, sometimes luck is the key ingredient. It can be argued that it’s luck plus something else, but in many cases, luck is the big thing. Such was the case here. I’ve already told the story of how Bill, Todd, and I sought out for Union Point, with the plan to photograph the sunset from there. We didn’t stay up there for sunset, which turned out to be very lucky, and not just because we would have had to descend the dangerous portions Four Mile Trail in Yosemite National Park in the dark. As it turned out, heading back down early put us in what I’m convinced was the absolute best part of the trail for the sunset, which was nothing short of incredible. Our view was great because it offered us essentially 180 degrees of Yosemite National Park from a great vantage, including a view of Half Dome (which we totally stumbled upon by climbing over some rocks at the end of a switchback). The view of Half Dome was similar to what we would have had at Union Point, except at Union Point, there would have been no view of anything to the east–meaning no shooting into the sunset itself. Granted, Half Dome did have a nice, pink glow on it, but the sun falling behind El Capitan was what was really impressive. Only an hour or so earlier, we were worried that there would be nothing in the way of a sunset, as the cloud cover wasn’t right. Just before sunset, the sky turned to the perfect mix of clouds and clear sky, allowing the sun to “bounce around like crazy and do it’s thing” (pretty sure that’s the best scientific explanation of what happened). We had about 45 minutes of constantly changing colors, and the three of us raced from side to side on that trail taking who knows how many photos. We were all exhausted by the end of the sunset, yet very satisfied with our (lucky) bounty. Our meals at the in-park cafeteria had been pretty bad prior to that, but that night’s meal was amazing after all that running around! Purchase high quality prints of this photo or others by clicking the image above (or visiting my photo galleries) and clicking the green “Add to Cart” button. You can also navigate to the 2,000+ other images in my photo galleries from there! Photographed with a Nikon D600 and the Nikon 14-24mm f/2.8 Lens. This was sort of a bear to process. The colors were untamed and vibrant straight out of camera, and I actually did very little to punch them up. Instead, my main goals were cutting down on color bleed (in the middle of the sunset–you can still see some) and bringing out a little detail in the dark areas of Yosemite Valley, but not too much detail. I’m not a fan of sunsets that have perfectly mid-daylight bright foregrounds, as I think that looks incredibly fake. I prefer to find the middle ground between that and silhouettes (or sometimes just go completely for a silhouette). To accomplish this, I increased the shadows levels while simultaneously increasing the blacks and contrast to make sure that things didn’t have too much detail, but instead popped with contrast. I increased the vibrance just a smidge, but then manually decreased the saturation in the orange and red color channels to avoid most color bleed. That was all done in Adobe Camera Raw. I then opened the photo in Adobe Photoshop CS6 and did a curves adjustment layer to get the blacks and colors accurate. What do you think about the role of luck in photography…and life, I suppose? Have you ever captured any super-lucky shots? Share any thoughts you have in the comments!